New kiosk sells items to benefit STEM education. Holiday shoppers looking for local gifts this month needn’t look farther than the lobby of the Bradbury Science Museum. That’s where the Bradbury Science Museum Association (BSMA) will set up its moveable kiosk—a gift shop called Gadgets—starting Friday, December 2. 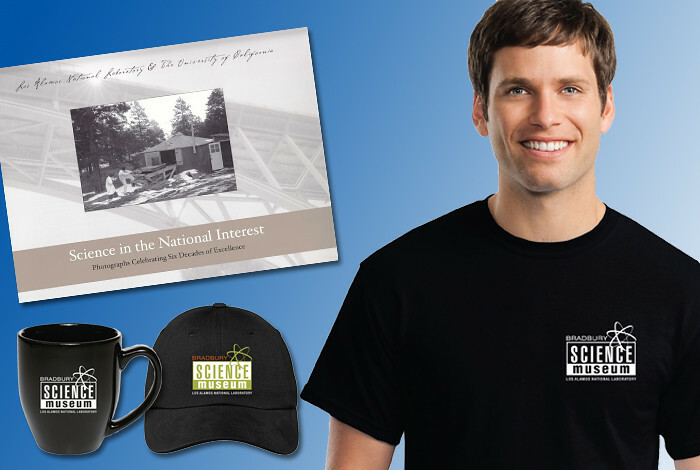 At Gadgets, BSMA volunteers will sell science-themed items including mugs, T-shirts, books, thumb drives, phone chargers, and travel tumblers with the Bradbury Science Museum’s logo. Eventually the BSMA hopes to increase its inventory to include magnets, postcards, note cards, calendars, and more. “These items were chosen based on surveys asking visitors and Lab employees what they would like to buy,” explains BSMA Secretary KayLinda Crawford, noting that the Bradbury receives more than 80,000 visitors annually and at least 50 percent of those folks expect to find a museum store. In addition to opening a gift shop, the BSMA also plans to provide volunteer opportunities, expand museum outreach, and build support for the museum mission through memberships and donations. As the Bradbury’s nonprofit partner, the BSMA will fill these roles because the museum cannot legally fill these roles itself under its Department of Energy regulations.